My job is to ensure that more people have access to water and sanitation in Yemen, one of the most water-scarce countries in the world. After less than a month there, I had to leave Sana’a, along with other international United Nations colleagues, because of the escalation in conflict. It is now the holy month of Ramadan and I’m back in Sana’a. Although it feels good to be back, my return comes with mixed feelings. The lively and bustling city that I left just three months ago is now deserted, except for the kilometres-long lines of cars waiting for petrol and the garbage piled up on the streets. We drive past a checkpoint, where I see a boy with a rifle, clearly too young to be holding a weapon. A bit further down the road, people queue up at a mosque to fill their jerry cans with water. Desperation is visible in their eyes. 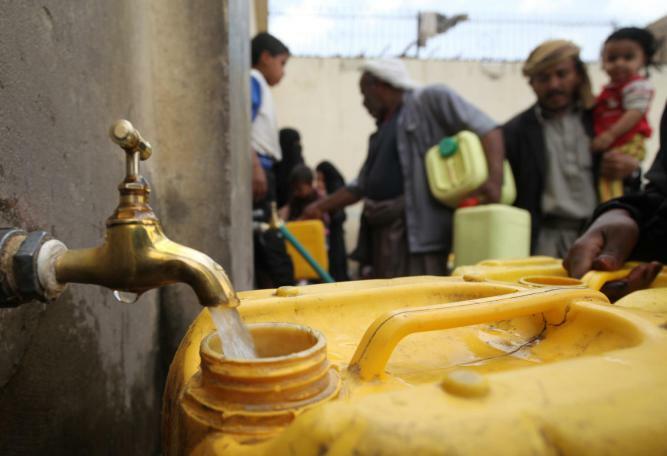 The conflict in Yemen has brought the country to the brink of a humanitarian catastrophe. A colleague describes it as “the straw that broke the camel’s back”. Schools, hospitals, roads and bridges are damaged, and public services have collapsed. Supplies of food, fuel and medicines are critically low, and the lack of safe water and proper sanitation poses serious health risks to millions of people. It is clear that the people of Yemen are suffering and need urgent help. And that’s exactly why I came back. My team and I are working around the clock to provide children and their families affected by the conflict with clean water and basic hygiene kits that contain necessities like soap and jerry cans. 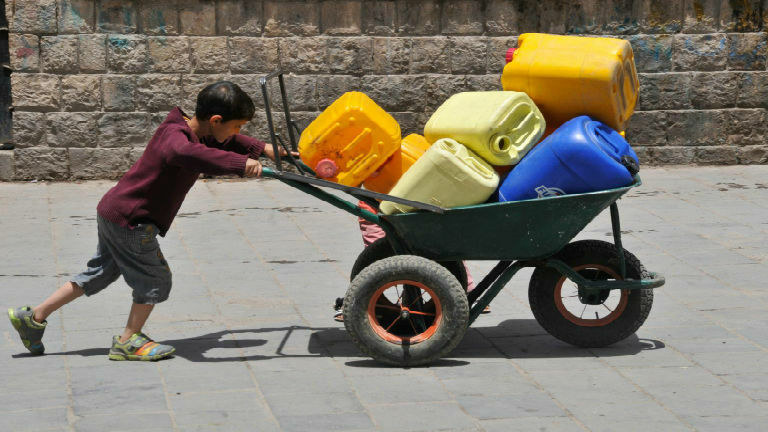 © UNICEF/NYHQ2015-0870/HamoudBack in April, residents fill their containers with water at outdoor taps in Sana’a. The United Nations estimates that 80 per cent of the population is in need of humanitarian assistance, a number that gives me goose bumps. But small things continue to inspire me, like the trucks on the streets of Sana’a that have started to collect garbage strewn all over, which has in part been possible because of UNICEF’s contribution of fuel to the local authorities. UNICEF is also providing fuel for over 10 cities in the country, to keep the pumps of the urban water systems operational, thereby reaching millions of people. From time to time, emotions overwhelm me. Of course my heartbeat goes up when my bed shakes from the loud bombing nearby at night. But it affects me more when I get the news that a staff of one of our local partners was shot by a sniper while delivering water to a community, and another constructing latrines for displaced people was kidnapped for a week. At the same time, there are heroic stories of those involved in transporting supplies and fuel to pump water to areas where heavy conflict is ongoing, and where no assistance was able to reach before. I feel a lot of respect for all of my Yemeni colleagues who continue to go out and serve those displaced while putting their lives at risk. Being back in Yemen has brought me closer to my team. I’ve begun to understand the difficult conditions people face every day, and that it hasn’t stopped us from planning big and going the extra mile. What if we could negotiate access to collect the solid waste in Aden, where a disease outbreak is looming? What if we could distribute hygiene kits to the people who are left behind in Sa’ada, because they have no means to leave the area? Reaching these people is so important, because our biggest fear is that the children of Yemen won’t die of bullets and bombs, but of preventable diseases like diarrhoea and pneumonia. In addition to medical services and vaccinations, providing clean water, a toilet and a piece of soap can literally save a child’s life. Even if the conflict rages on, and we are denied access time and again, we will continue to try to reach out to those most in need. But most importantly, we will continue to hope that one day this conflict will end and peace will return to the people of Yemen.